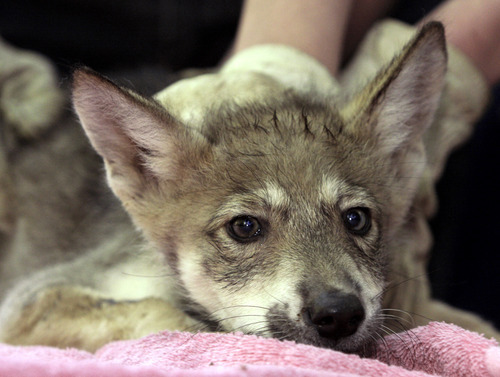 Wildlife • Herbert says feds plan to let canines in S. Utah; U.S. agency calls fears premature. 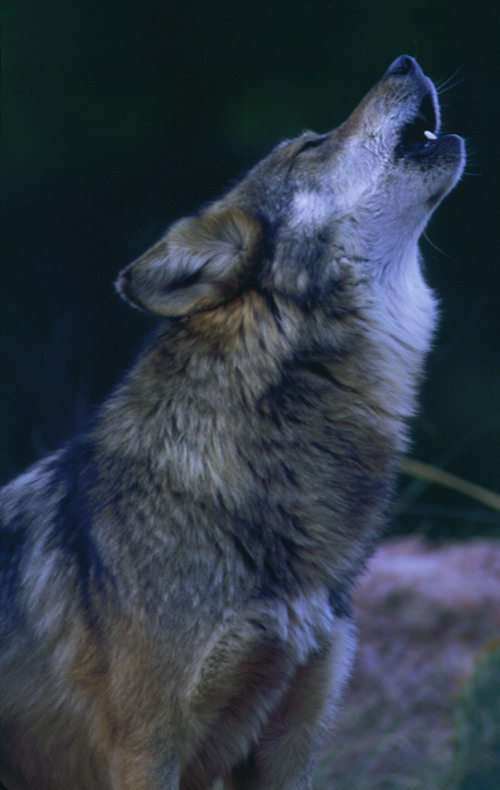 Courtesy of Center for Biological Diversity Mexican Gray Wolf, copyright Robin Silver. The Mexican Gray Wolf is one of the rarest mammals in the world. An adult Mexican Gray wolf keeps watch at the Endangered Wolf Center, Thursday, July 1, 2010 in Eureka, Mo. The wolves are bred in captivity and released in New Mexico and Arizona, and now Utah officials fear their state will be included. (AP Photo/Tom Gannam) Tom Gannam | The Associated Press In this July 1, 2010 photo, one of five eight-week-old Mexican Gray wolf pups gets a quick check-up at the Endangered Wolf Center in Eureka, Mo. The wolves are bred in captivity and released in New Mexico and Arizona, and now Utah officials fear their state will be included. Utah's governor and wildlife chief are sounding the alarm about wolves on a second front, fearing the federal government is about to classify Mexican gray wolves for protection in the southern part of the state. Gov. Gary Herbert and Division of Wildlife Resources Director Jim Karpowitz wrote to Interior Secretary Ken Salazar and U.S. Fish and Wildlife Service Director Daniel Ashe, respectively, in late September, protesting what they say is the federal wildlife agency's apparent plan to expand protections from Arizona and New Mexico into southern Utah and Colorado. Herbert's letter, obtained through an open-records request, asserts that Fish and Wildlife officials are telling the state they will reclassify the Mexican wolf as a subspecies  granting it full protections wherever it roams  and include Utah in its recovery zone. The governor disputes that the lobo's range, mostly in northern Mexico, ever reached here. "The only explanation they give," Herbert wrote, "is that Utah and Colorado have unoccupied wolf habitat, and therefore must contribute to the recovery of the Mexican wolf." Utah officials and lawmakers have made clear that they want wolves kept out or minimized in an effort to protect livestock and big game. The Fish and Wildlife Service, insisting it hasn't yet chosen how to advance a recovery program, is sending its Southwest regional director to Salt Lake City for a meeting with Karpowitz on Thursday. State officials' nightmare scenario, Karpowitz said, is that Mexican wolves moving in from the south would trigger statewide protections even if the recovered Rocky Mountain gray wolves from the north have no Endangered Species Act safeguards. A state wanting control over Rocky Mountain wolves could be thwarted by a look-alike protection clause in the law. Although generally smaller, Mexican wolves would be hard to distinguish from their northern cousins. "There are wolves in Utah now," Karpowitz said, "and if they try to recover Mexican wolves in Utah, who's who?" Wendy Brown, Fish and Wildlife's Southwest Region recovery coordinator, said the agency is considering options but has not yet issued a draft plan for public comment. Even if the plan ends up including Utah as potential Mexican wolf habitat, she said, there wouldn't be any reintroduction without a separate public process. In an Oct. 28 letter responding to Karpowitz, Ashe said his agency has not made any decisions about reclassifying the wolves. He wrote that Karpowitz had "mischaracterized the facts of the matter, the choices before us and their implications and also implied that the service has already decided how we intend to proceed." "We hope to move forward in a collaborative partnership with the Utah Department of Natural Resources and the other states," Ashe wrote, "as we chart a path for management and recovery of this species." Mexican wolves were nearly extinct in the 1970s, when the U.S. began a captive-breeding program. In the early 1980s, the government established a goal of 100 wolves living in the wild in the Blue Mountains of New Mexico and Arizona, but there was no clear plan for recovery or thresholds for removal from the list of endangered species. The agency now is working with interest groups and states to write that official recovery plan, and Utah's participation in the process is what led state officials to assert that the Beehive State would be included. A major concern for Karpowitz is the plan's potential to reclassify Mexican wolves as a subspecies, giving them continuing protection regardless of whether the larger gray wolf population is deemed recovered. Karpowitz also objected to the agency excluding historic Mexican wolf range in West Texas, apparently for lack of local support or federal lands, while including potentially new range in Utah. "They want to recover them in an area where they never were," Karpowitz said. Wolf advocates say it isn't so simple. 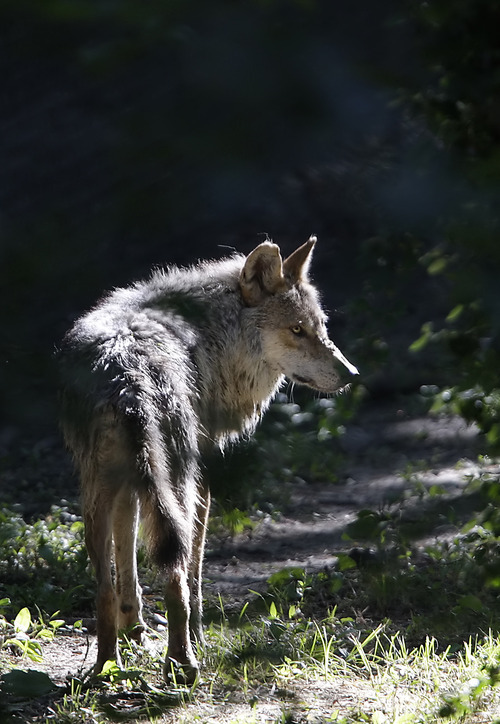 Western wolf populations overlapped and interbred before settlers and the government largely eradicated them, said Kirk Robinson, executive director of the Salt Lake City-based Western Wildlife Conservancy. "That's part of their natural domain," Robinson said of southern Utah, "whether it's Mexican wolves or whatever subspecies can make it there." Brown said genetic samples from wolves killed in Utah, Colorado and Nebraska show similarities with Mexican wolves, indicating possible interbreeding. Only 50 of the planned 100 wolves are now roaming the Southwest, though Eva Sargent, Defenders of Wildlife's Southwest director, said recent collaborations with ranchers should help.